There are many basic techniques to learn in order to understand rhythm guitar. This guide will focus mainly on metal techniques. Firstly, we will start with how to pick using your right hand. It is highly obvious that the plectrum is held with your index finger and thumb. Hitting the string as the lower-middle area is the most common area, remember that the lower you go (towards the bridge), the tighter the tension will be. There are many styles of picking, firstly would be alternate picking, a very common technique in metal, which is often used for faster parts, to get a “chugging” sound or when moving between strings. Simply hit the string “downwards” and then “upwards” to do this. Next there is the very popular downstroke. Many people may disregard the downstroke, but in metal, it is VITAL. There is an obvious difference in downstroking than performing an alternating picking pattern; firstly, downstroking a note repeatedly would sound like “Chug-chug-chug”, whereas alternating would give off a “Chuga-chug-chuga-chug” sound. This basically means that alternating between up and downstrokes would give two slightly different sounds, but using the same style of picking over again would only give off one, producing a much cleaner sound. Downstroking at slower speeds is simple, but when you increase the speed, it can become very intense. 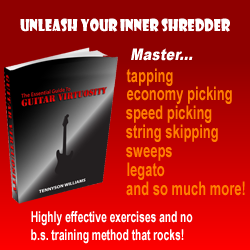 For a one string downstroke task, try the introduction to “Master Of Puppets” by Metallica. Playing at fast speeds is also made harder by alternating strings, hitting the different strings while only moving downwards adds a lot more difficulty. A good example of this would be the main riff to Metallica’s “Blackened”. Don’t be discouraged if you are unable to perform a song in downstrokes, as it is something which all people must build up. You can play for years with no experience downstroking, only to move onto it and not being able to perform half as well, so keep practicing and eventually you will be able to downstroke perfectly! Also, while downstroking you may notice your forearms or biceps begin to ache, this is normal, but can often prevent you from downstroking fluently. Practice can prevent this form happening as easily, but exercising your arms will undoubtedly help. Try using some dumbbells to help endurance. Another common technique would be “speed picking”. This is hitting the same, or sometimes different notes at a high speed continually. For example, the introduction to Slayer’s “Angel Of Death” or the outro to “Postmortem”. Unless you have incredible strength in your arms, the work will be done with your wrist. Outstretching your fingers (Not including your picking finger and thumb obviously) can also help as it provides more space for your palm if you are palm muting. There will also be times when you are made to jump between strings, whether it be octaves or fifths. This can be heard in the ending solo to “Hangar 18” by Megadeth. It is commonly much easier to hit the higher note with an upstroke if you are returning to a lower note afterwards, unless the riff is slower and is done using palm muting in which case it may be possible to downstroke it.